The prediction in 1940-something that Mother’s new bairn would be born in late October may have caused some angst. In Scotland, those of a superstitious nature would have been in a ‘swither’ (a state of nervous agitation). But “no worries” as we say in Australia. I was born the day before Halloween, with 22 hours to spare. My friend Ingrid says that apart from it being her birthday, October 31 is a ‘non-event’. But her American friends are horrified, in a swither, even, because of the tradition that deems the 31st to be the date departed spirits return to earth. The chances of giving birth on Halloween (October 31) are considerably lower than those who drop a sprog on Valentine’s Day (February 14), according to the journal Social Science and Medicine. Researchers studying birth data a week either side of those dates said the chance of giving birth on Halloween dropped by 11.3%, with 16.9% fewer C-sections, 18.7% fewer induced births and 5.3% fewer spontaneous births. On Valentine’s Day, statistics say the likelihood of giving birth rises by 5% and Caesarean births are 12.1% more likely, prompting speculation that women deliberately schedule C-sections to have Valentine’s Day babies. I have vague early childhood memories of Halloween in Scotland where bairns wear ghost costumes and go door knocking. You don’t get something for nothing in Scotland. You had to sing, dance or recite poetry to be rewarded with a sweetie. Meanwhile, the traditions of Halloween, or to be more precise, the retail world’s version, have been imported to Australia. It’s a relatively new thing, but gathering pace, year by year. Former colleague Jeff Sommerfeld, also an October 31 baby, says he was spared trick and treaters for years by virtue of living in an inner city apartment, where door knockers rarely strayed. But since he moved to the country, it’s a different matter. “Last year I was quietly watching television on October 31 when I heard the doorbell ring and to my surprise there were children, escorted by a parent who cried out “trick or treat”. I did not chase these people away, but rummaged through my cupboard and found some lollies that I have for sweet tooth indulgences. Jeff and I share a dislike of the incursion of American culture into our way of life. The brutal truth of the matter is the retail sector needs to cram its calendar with special days that will boost turnover and present opportunities to sell unique stock. It starts with Australia Day and the related merchandise, which includes flags to fly from your car, real flags, Australian flag flip-flops, stubby holders and cigarette lighters, packs of cards, beach towels and sun hats. The fiscal joy for retailers of this strictly Australian event is that unsold stock can be stored away until next year. Then comes Valentine’s Day – a big thing in Australia with almost 90% of people aged 18-24 said to mark the day of lovers in some significant way. Ibisworld Research estimated that Australians spent almost $800 million on Valentine’s Day in 2014, $42 million of which went on restaurant meals. There are other imported anniversaries which cynics dub “Hallmark Holidays”, including Mothers’ Day and Fathers’ Day. Some of you Brits will notice how I skipped over Guy Fawkes (November 5), a macabre celebration which now barely registers in Australia. It was quite a thing when we were children and the custom is still big in New Zealand, albeit tightly regulated. The sale of fireworks was banned in Australian states in the 1980s, partly because of injuries and burns, but also because of the risk of bush fires in November. The custom is still popular in the UK, where people start building bonfires in October while children make “guys” which are traditionally burned on Guy Fawkes’ night. For the benefit of readers under 40, a summary: The Brits foiled a plot to blow up the House of Lords on November 5, 1605. Spanish anarchist Guy Fawkes, who was found guarding a stock of explosives associated with the “Gunpowder Plot”, was arrested, tortured, and executed. Every year thereafter on November 5, effigies are ceremonially burned, with or without Guy Fawkes masks, while fireworks are let off.You may have seen the stylised face mask (pictured above), designed by British artist David Lloyd as part of the 1988 book series V for Vendetta. The mask has become well-known through the movie of the same name. It has also been appropriated by the Hacktivist group Anonymous, worn at protests and rallies, including Occupy Wall Street. Lloyd created the original mask image for a comic strip written by Alan Moore. 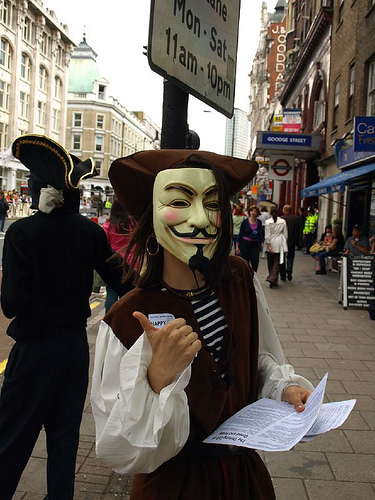 He told Rosie Waites of BBC News Magazine the mask had become a convenient placard to use in protest against tyranny. “I’m happy with people using it, it seems quite unique, an icon of popular culture being used this way,” he said. Sydney Morning Herald fashion editor Paula Joye was invited to a Halloween soiree in 2011. After donning a traditionally appropriate outfit, she arrived to find something resembling a Hugh Hefner garden party. The skanky witch takeover is but one diversion from ancient traditions. No wonder there is a Catholic-led campaign to “reclaim Halloween”. Some Christian families want to redeem Halloween from these unsavoury associations because of its links to ancient traditions. Halloween is, after all, the evening before All Saints Day which the Church celebrates on November 1st. All Souls Day follows on November 2nd, when Catholics pray for all the dead. Meanwhile, Mr Sommerfeld has stocked his country larder for this year’s trick and treaters.